PakPeak Spantik (7027m) needs to be pronounced as “SPAAN-tk” rather than “Span-tick”. According to Pakistan’s legendary mountaineer Nazir Sabir it is the “easiest” peak in Pakistan above 7000m. It stands out among 170+ Category B PakPeaks (7000-7999m) mainly due to its relative ease of ascent and scarcity of objective dangers making it a popular choice with organized commercial expeditions. More recently it has become a favorite for climbers to train for higher elevations. Although it is famously called as Golden Peak there are at least eight different names of PakPeak Spantik (7027m). A PakPeak with Eight Names ! 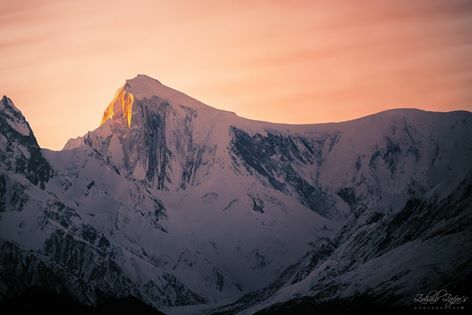 PakPeak Spantik (7027m) has at least eight different local as well as foreign names.The names include Spantik,Golden Peak,Ghenish Chhish,Golden Pari,Golden Pillar,Queen Mountain,Pyramid Mountain and Yengtuz Sar. Spantik is a Balti word and originated from Sapang which means Garden and Tik is Little. So Sapang – Tik means Little garden. Probably this name hints towards a small green patch on its south ridge . In Burushaski , one of the four major local languages of the area apart from Shina, Wakhi and Balti, it is called as “Ghenish Chhish”, means “Golden Mountain”. The name refers to the “gold effect” on the peak particularly during sunset. Additionally, Ghenish in Broshaski also means Queen referring to its might and beauty and hence the Queen Mountain. The northwestern face on the Nagar / Hunza side of the mountain features an exceptionally hard climbing route with its bright red color and is called as “Golden Pillar”. Renowned English mountaineer William Martin Conway (Conway Saddle fame) named it as Golden Parri, which means Golden Fairy. Due to its noteworthy 1187m topographic prominence it is sometimes also called as Pyramid Mountain. According to few sources its another name is Yengtuz Sar. PakPeak Spantik (7027m) lies to the south of the Hispar glacier and above 40 km long Chogolungma Glacier.It is to the east of PakPeak Diran (7266m) and northeast of PakPeak Malubiting (7291m).It lies in the 120 km long Spantik-Sosbun Mountains Group a sub range of 500 km long Karakoram Range .The range trends roughly in east-west direction.The other renowned peak of Spantik-Sosban Group is PakPeak Sosbun Brakk (6413 m). The summit of PakPeak Spantik (7027m) on clear days presents views of neighboring PakPeak Rakaposhi (7788m), PakPeak Diran (7266m) , PakPeak Malubiting (7291m), PakPeak Ultar Sar (7388m), PakPeak Haramosh (7409m) and PakPeak K2 (8611m) far beyond. Neighboring peaks of PakPeak Spantik (7027m) and approaching from Skardu / Baltistan side. PakPeak Spantik (7027m) can be approached from Nagar Valley / Hunza as well as from Skardu / Baltistan side. From Skardu it can be reached in about four days. This include one day Jeep travel from Skardu followed by three days of trekking on and beside 40 km long Chogolungma Glacier.The approach path offers vistas of mountain scenery with innumerable high PakPeaks. Here is a typical itinerary. Reaching Skardu This can be done from Islamabad By Air or on KKH via Chilas upto Skardu. Skardu to Arandu Village (2950 m) It is almost ten hour winding jeep drive to Arandu Village a community of about 600 inhabitants. Three day approach trek starts from Arandu. Khurumal to Bolucho (3,900 meters) It is relatively short stage, which takes 4 –5 hrs. It passes through Gharincho , a small lake and views of Spantik and Laila Peaks to reach Bolucho, situated at the base of the Bolucho Glacier. (Overnight Camp III). From Bolucho to Base Camp (4100 meters) The basecamp is located at the bottom of the access ridge to the SE ridge and is footed on a moving terminal moraine. Base Camp to Summit – Normally three high altitude camps are established to climb PakPeak Spantik. (7027m).Typical altitudes are Camp I at 4550 m, Camp 2 at 5500m , Camp 3 at 6550m. Summit is 7027m. South East Ridge – The climb along the Southeast ridge is a straight ascent with a gradient of 30º to 45º with a mixture of some hard and easy patches. It is most commonly climbed line. South West Route – Southwest route also goes along a snow ridge of moderate angularity. North West Route (Golden Pillar) The less traversed face is visible from Hunza. Dr. and Mrs. Workman made first attempt to climb the peak in 1903 via the Southeast ridge by . They ascended up to 330 meters of the summit. PakPeak Spantik (7027m) was first climbed in 1955 by five member German team led by Karl Kramer’s . It was climbed in 1978 by Japanese expedition led by Nakamura. British climbers Mick Fowler and Victor Saunders climbed the Northwest Golden pillar in 1987, but they returned via the imminent Southwest spur. The First Pakistani expedition was held in 1988 by a joint Pak German team with six men from Pakistan Army.The first Pakistani who reached the summit was Captain (later Brigadier) Muhammad Moiz Uddin Uppal. In July 2011 it was scaled by Aus-Pak expedition led by a team of mountaineers from Army High Altitude School Rattu. Lt Col Abdul Aziz was supervising the team of Climbers . In July 2012 , a China-Pakistan Friendship Expedition scaled PakPeak Spantik (7027m). Expedition leader was Col Dr Abdul Jabbar Bhatti who later become fourth Pakistani to summit Everest. At 9:16 am on August 2 , 2017, 43 yr old Uzma Yousaf became first Pakistani lady to climb PakPeak Spantik (7027m) as well as any 7000m peak in Pakistan. Uzma’s high altitude team included Wajid Ullah Nagri, Asghar Hussain and Yaseen. It took her team 31 days to complete the voyage. Although PakPeak Spantik (7027m) is technically easy but it is for mountaineers who have the experience of climbing as independent roped parties on snow and glaciers and at least have been on some smaller peaks.The normal northern summer climbing season stretches from May through to October each year. 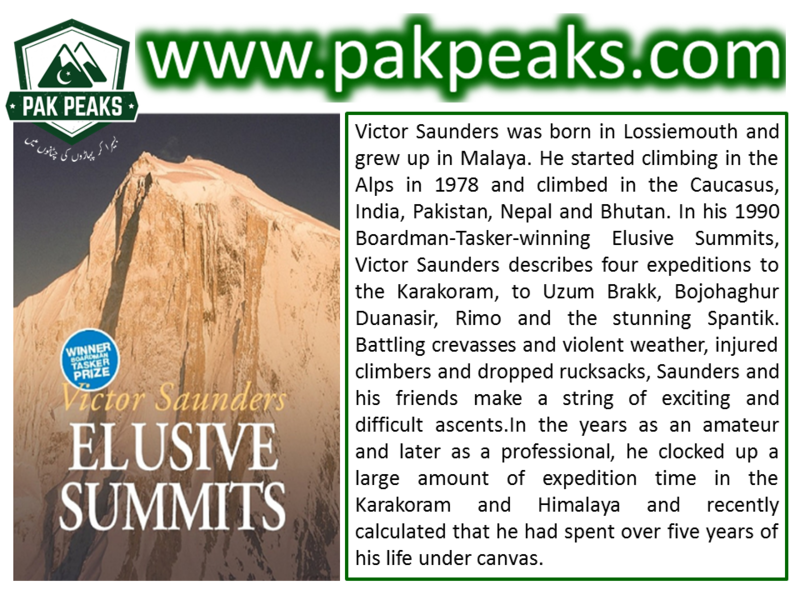 Award wining book Elusive Sumits describes about PakPeak Spantik (7027m) expedition. Here is a link to PakPeaks Spantik (7027m) Playlist on YouTube. Eight Reasons Why K2 Is Tough. © 2017. Pak Peaks. All rights reserved.